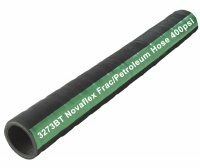 Oil Field Fracturing Hose is designed for higher pressure discharge applications that require working pressures up to 400 psi. This hose is a rugged design and has an all weather cover which is resistant to oil, cuts, abrasion and gouges. This hose can have a UHMW wear cover added for additional abrasion resistance (U version). The tube is resistant to petroleum products with aromatic content to 55%. Reinforcement: Multiple plies polyester tire cord. Cover: a. Smooth black oil, ozone & UV resistant compound. Fuel Compatibility: Ethanol up to E85. Biodiesel up to B20.